Oberkampf founded a factory of printed cotton in Jouy-en-Josas, which soon became internationally known. A Swiss Protestant, he married into the French Protestant community. After him, his children were to do likewise. Christophe Philippe Oberkampf (1738-1815) © S.H.P.F. 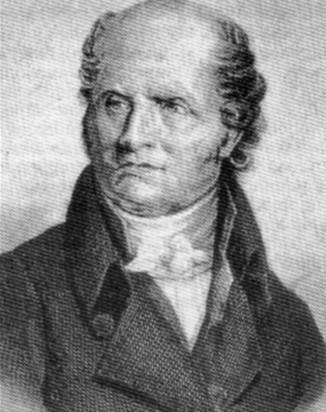 Christophe-Philippe Oberkampf was born in Wiesenbach (Brandenburg-Anspach). He was the descendant of a long line of Lutheran dyers from Wurtemberg. 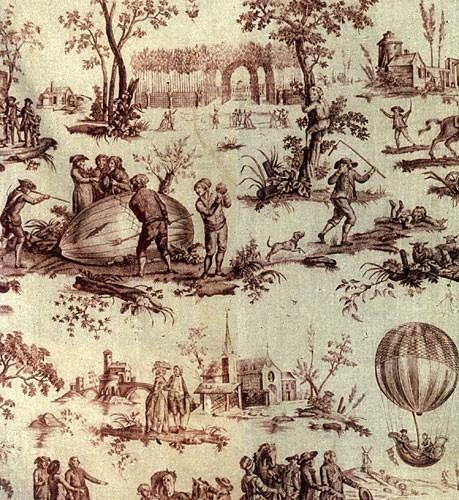 He learned the trade with his father, a manufacturer of printed cotton, established in Aarau (Switzerland). In 1756, at the age of 18, young Oberkampf, acquired his independence and started working as an engraver at the printing factory of Samuel Koechlin and Dolfuss in Mulhouse. In 1758, he settled in Paris, and in 1762, with Antoine de Tavannes, he established a cotton printing factory in Jouy-en-Josas. Shortly before the French Revolution, it was the second industrial firm in France after Saint Gobain. Between 1765 and 1805, the Manufactory was extremely successful. Oberkampf employed the best skilled workers and improved the printing processes : during the first ten years, he used woodblocks, then copper sheets and finally engraved copper rolls, which resulted in a faster printing process. The motifs were varied : flowers, birds, garlands, characters from fashionable novels and fables, exotic scenes in oriental style. Outstanding artists, such as Jean-Baptiste Huet (1745-1811), worked for the Manufactory. Oberkampf sought technical innovations : cotton was bleached, and no longer spread out in the open air to whiten, the use of a single print of green, and not two, was developed, the colours are varied and well fixed and the lightweight fabrics were to be used for clothing as well as for upholstery. All this helped to build up the international reputation of the “Manufacture de Jouy”. Under the “Consulat” (1799-1804), Oberkampf set up chemistry courses at Jouy, to which he invited famous teachers such as Berthollet and Gay-Lussac. In 1804, he built a cotton mill and weaving factory that supplied him with the necessary basic materials. The factory opened in 1810. Even though he was a Protestant, he was never hindered in his activities under the Ancien Régime. However, the Roman Catholic priest of Jouy -en-Josas noticed that neither Oberkampf nor his workers went to mass, thus giving the local people a bad example. In 1742, Louis XVI awarded him letters patent of nobility and his manufactory obtained the privileges of a “Manufacture Royale”. Thanks to his diplomatic skills, and to some political opportunism, Oberkampf did not emigrate during the French Revolution, but managed to keep the factory working. He subscribed to State loans, he was elected mayor of Jouy. He took part in the establishment of the Société populaire de Jouy and he controlled it through Petiteau, his brother-in-law, while the National Guard was commanded by his nephew, Samuel Widmer. The manufactory was declared of use to the Republic. However, in 1794, Voët, an engraver working at the manufactory, accused Oberkampf of “moderantism” and of royalist sympathies. He denounced him to the Comité de Sûreté Nationale. Fortunately, the complaint was not taken into account and somewhat later, Oberkampf agreed to accept Voët back into the manufactory. Under the Consulat and the Empire, business picked up again. In 1806, Napoleon came to Jouy accompanied by the Empress, and awarded Oberkampf with the Légion d’Honneur. In 1815, the Prussians and Cossacks occupied the area around Jouy and the manufactory had to cease working. Oberkampf was disheartened and he dies after 55 years of industrial activity. After his death, his son Emile succeeded him until the manufactory was to be sold in 1822. It was to closed down in 1843. 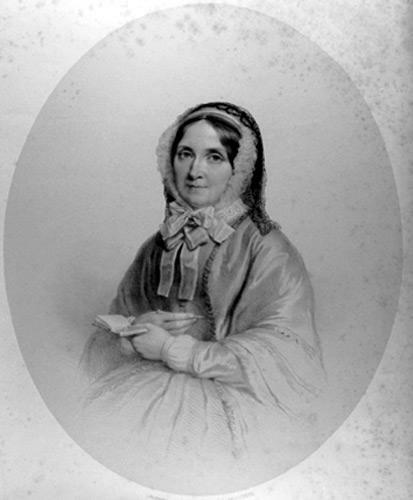 Mrs Jules Mallet © S.H.P.F. Oberkampf married Marie-Louise Petiteau in 1774, and the ceremony was conducted by a Lutheran pastor at the Swedish Embassy in Paris. She died in 1782. In 1785, he married Anne-Michelle Massieu de Clerval, and this time the ceremony was conducted by a Calvinist pastor in the chapel of the Dutch Embassy in Paris. Oberkampf’s children were baptized in the Protestant church in Jouy and he was careful to ensure that his children and his nephews be well established in French Protestant society. His daughter Emilie (1794-1856), the wife of Jules Mallet, became well known for her numerous charitable activities.